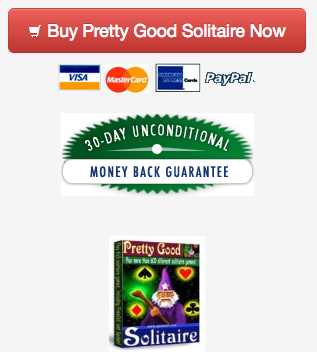 A new release of Pretty Good Solitaire is now available. Version 9.1.0 is available for download from <http://www.goodsol.com/download.html>. Version 9.1.0 adds 10 new games to bring the total number of games to 560. The new games are American Canister, Balcony, British Canister, Chelicera, Double Signora, Firing Squad, How They Run, Madame, Roman Patience, and Signora. Also added is a new game type group, the Terrace type games. Many of the new games belong to this new group. This version also has the annual mass changes to the game difficulty ratings and the winning percentage in the help file. Many games had their number adjusted to reflect user statistics as posted on the web site, particularly those games added in 2001 and 2002. Some of these games are just now getting enough games played to get a sense of their difficulty. <http://www.goodsol.com/upgrade.html>. New users can order at <http://www.goodsol.com/orderonline.html>. Comments on the new version are always welcome at tom@goodsol.com! <http://www.goodsol.com/download.html>. If you have version 7.0.0 or higher already installed, you can also download by running the game, selecting the Internet menu and selecting "Download Latest Version". If you download this way you will have the option of downloading either the full version or an update version containing just the new files for your particular version. Be sure to exit out of the running game before installing. Pretty Good Solitaire has once again been nominated by the Shareware Industry Awards Foundation for best non-action shareware game of the year. 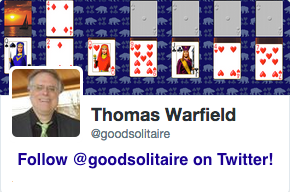 It's the fourth time Pretty Good Solitaire has been nominated. It won in 1999 and 2001. The awards are voted on by members of the shareware industry and the winner will be announced in July. This game is at Signora.